Designed For Light-Duty Work, This 4″ Bar Clamp Is Ideal For Gluing, Hold Down Work, And General Purpose Clamping. Throat:2″. MightyMini is a handy little guy that does the work of a 1-, 2- or 3-inch c-clamp – but nine times faster. Built to lighter specs, it can handle the majority of lighter duty clamping tasks. 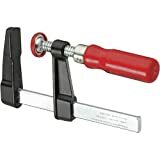 This clamp features quality cast jaws with a bright drawn steel rail serrated on two sides, an ergonomic grip wood handle, and a protective non-marring cap. There’s a 2-inch nominal throat depth with a 4-inch nominal opening.